My goal of achieving a cat free garden was always driven by the annoyance I and most gardeners have felt at some time or other when finding cat poop has replaced your carefully nurtured seedlings. I’ve never really considered the health risks involved but following the above question arriving in my inbox I’ve done a bit of digging and it does not make for good reading. The first decent article I found on the subject was at The Nest which stated that cat poop carries a parasite called Toxoplasmosis which can be passed on to us. It also mentions that you could end up with roundworm should you touch your mouth after handling any contaminated soil – bad news if you like a smoke while you are gardening. The Morning Call digs a little deeper and explains that because of Toxoplasmosis the cat poop can be especially dangerous for pregnant women or anyone currently suffering from a weakened immune system such as the old or infirm. I confess I had not heard of Toxoplasma Gondii until today but according to a paper written a few years ago by Drs. E. Fuller Torrey and Robert H. Yolken and published in the journal ‘Trends in Parasitology’ the infectious part of Toxoplasma Gondii found in cat poop is called oocysts and get this – a single cat can shred millions of these oocysts into the soil where it can survive for as long as 18 months waiting for an unsuspecting gardener to come along. It takes just 1 oocyst to infect a person. There are over 80 million owned cats and as many as 60 million ferrel cats in the USA (2013) and according to studies at the University of California that equates to 1.2 million tons of cat poop per year. Torrey and Yolken say that at any given time around 1% of cats are shredding the parasite – that’s an incredible 12000 tons of infected cat poop per year in America. 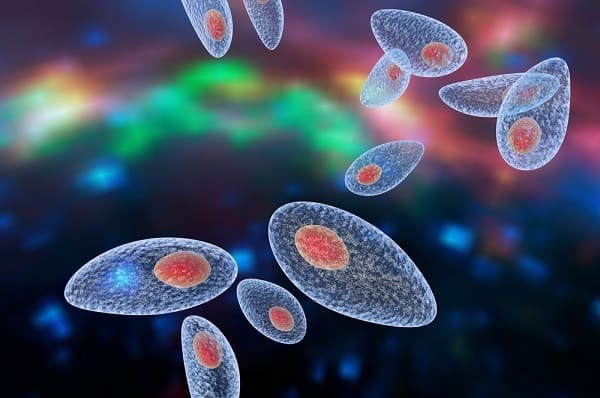 Over at the Centers For Disease Control website they warn that getting infected by Toxoplasma just before or during a pregnancy can end up with you passing on the infection to your unborn baby and worryingly, you will have no giveaway symptoms to warn you that you are now a carrier. While some infants are born with brain damage or blindness most will not have any symptoms but can develop problems in later life including mental disabilities and blindness. I came across a later study by Dr. Fuller Torrey – this one from 2016 – that found a possible link between Schizophrenia and cat ownership. According to the Cornell University the cat is the only definitive host of Toxoplasma Gondii which means the parasite can only lay its eggs (the oocysts) in a cat. Once a cat catches and eats an infected rodent the parasite is released into the gut of the cat. Here’s where they multiply in the wall of the intestine and produce the eggs and within 10 days of eating the infected rodent eggs are excreted out within the cat poop. Armed with all the above info about how dangerous cat poop actually is, here’s some tips on safely removing any you find in your backyard. Buy some quality rubber gloves and a garden trowel specifically for the job and don’t use them for anything else. Dig up an inch or two of the surrounding soil to ensure you have everything. Never compost it or flush down the toilet. Always dispose of in the garbage – double bagged. Clean the gloves and trowel with a detergent after use. Always scrub vegetables once harvested and never be tempted to eat any raw. If you are pregnant you should avoid contact with any cats that visit your garden and take extra precautions such as always wearing gloves when gardening. Prevention is definitely better than cleaning up cat poop so as a gardener what’s the best way to keep cats out of my garden? Unless you are a new visitor to Cats Away you will know I have purchased and tested most of the cat deterrents available and you can read how well (or poor) they all performed here. For those in a hurry who want the short version – water is your best friend when you need to keep cats out of your garden. Something like the Contech Scarecrow which detects the cats movement and fires a spurt of water in it’s general direction is enough to ensure that particular cat won’t be returning. At around $50 it’s not the cheapest option but it was by far the most effective and quickest I have tested. You can also use cat repellent plants in your garden or try these easy to make DIY cat repellent recipes. Another quick and easy fix is to cover any areas of loose soil – cats hate chicken wire and you can use this knowledge to your advantage. Whatever you do, do not try chasing or shooing the cat away as they know you’re not going to be quick enough to catch them – They’ll just laugh and come back time and again to annoy you. If your cat is an indoor cat and you don’t feed it raw meat then none of the above should worry you because an indoor cat is a safe cat. If you allow your cat to roam though you run the risk of your cat catching and eating an infected rodent which gives your cat Toxoplasma Gondii which in turn is then passed on to you – or worse, the neighbour who’s enjoying a bit of gardening or their child playing in his sand pit- Source. If that doesn’t concern you then how about the danger to your cat from other animals, poisons, road traffic, traps, torture, FID? Some areas in America and Australia have already passed bi-laws against allowing a cat to roam and as towns and cities get more crowded and the cat population increases you can expect more to follow. Consider installing a cat containment kit such as this one so that your cat can play in your garden safely and without the risk of wandering off. You will have a cat that lives far longer than a roaming cat and your neighbours will be happy they aren’t clearing away your cats poop every morning. I found this information very useful. Have a problem with cats using my garden as a latrine. My dog has remained within the confines of my property (inside or fenced back yard and deck). 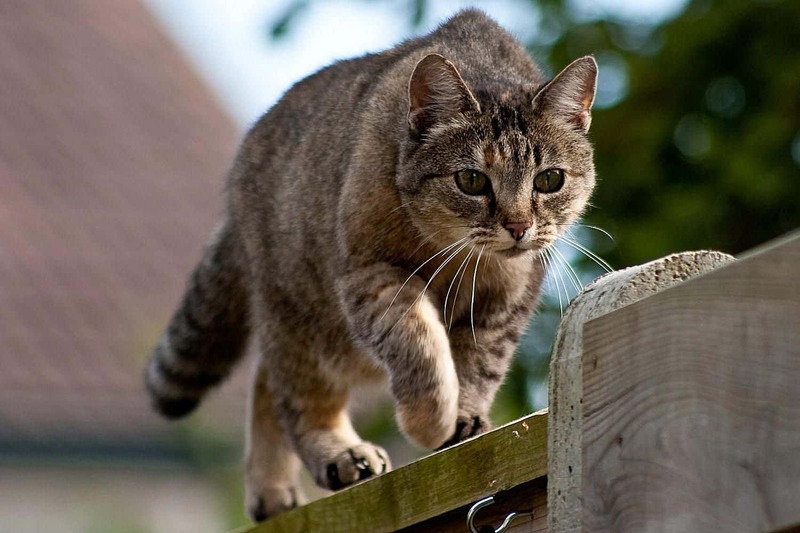 Feral cats continue to multiply more than once a year due to the warm climate where we live. Twice my dog has contracted intestinal infections, each costing me over $400 in vet bills to restore her health. That would have bought a lot of repellent. More importantly it would have caused her less suffering. I have a right to a disease-free yard in which to raise and train the animal I choose, not trespassers from the adjoining properties.